I was in London yesterday and was shocked by events inside and outside Parliament! I saw for myself what happened in the heart of Parliament Square and I heard eloquent and intelligent young people rage against the madness of the Coalition’s tuition fees policy. 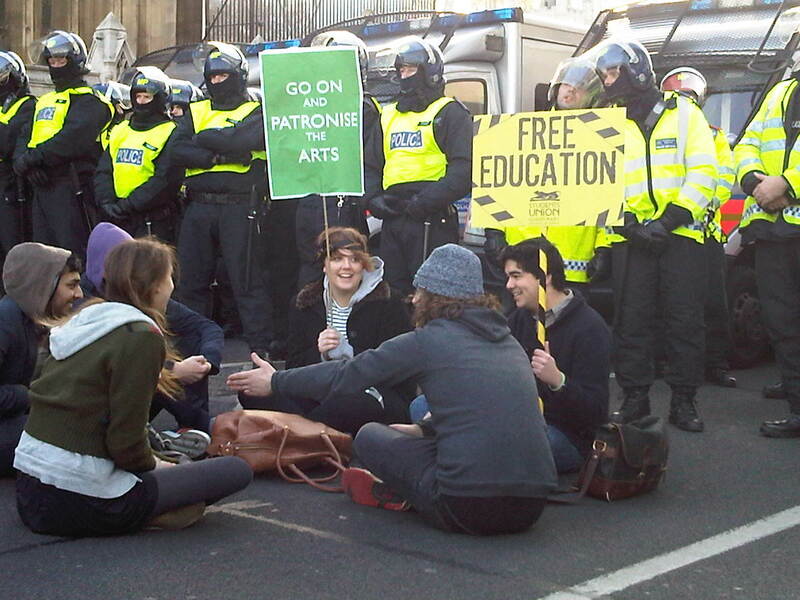 The Tory/Lib Dem Coalition government voted to massively increase tuition fees for students. There was heated debate in the House of Commons but Nick Clegg was unapologetic and eager to push the policy through. This was despite huge opposition from young people who protested on the streets of London outside Parliament yesterday. Lib Dem leader Nick Clegg appeared arrogant and out of touch in his media interviews. This went down very badly with young people! 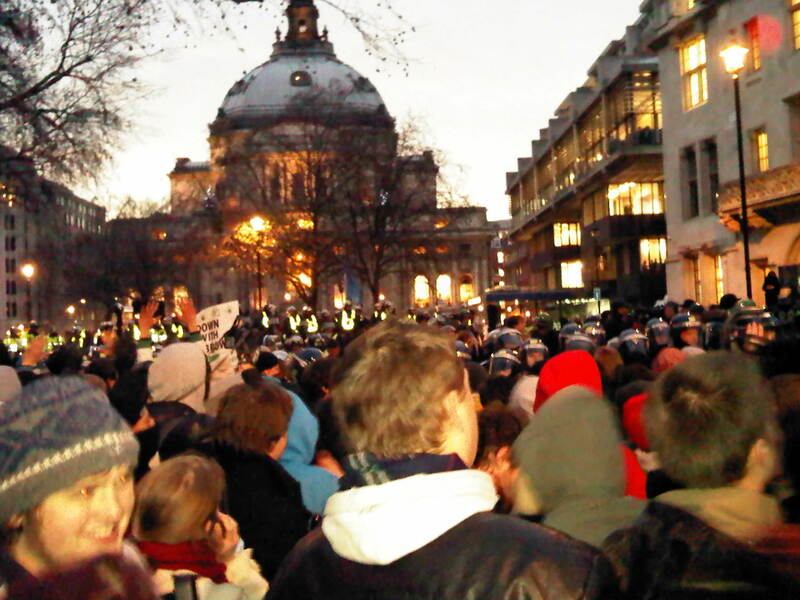 I saw the protests from both sides of the police lines and saw many injured young people and one injured policeman. There were some upsetting scenes which I chose not to photograph. This included one young man with blood pouring from his head onto the road. There was a whole group of injured young people sat on the pavement. 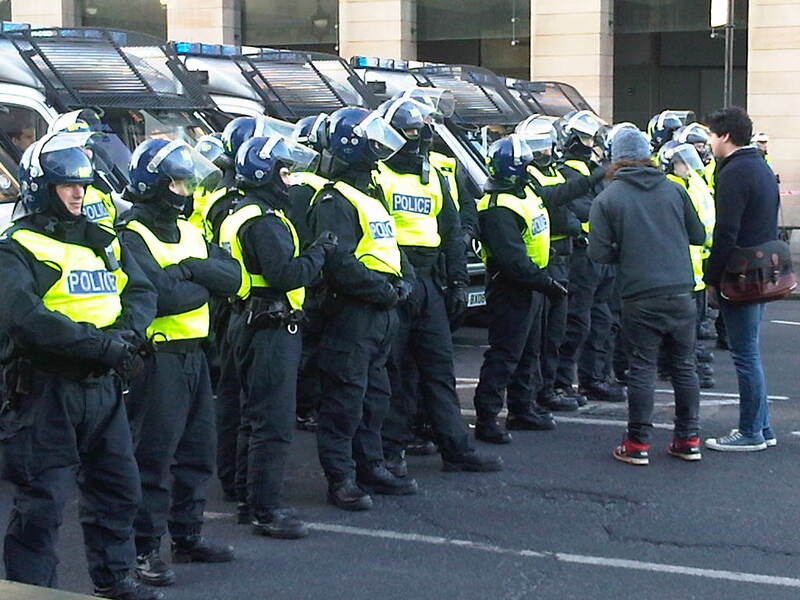 Police at times did seem very heavy handed with the crowds and there was huge anger amongst protesters. 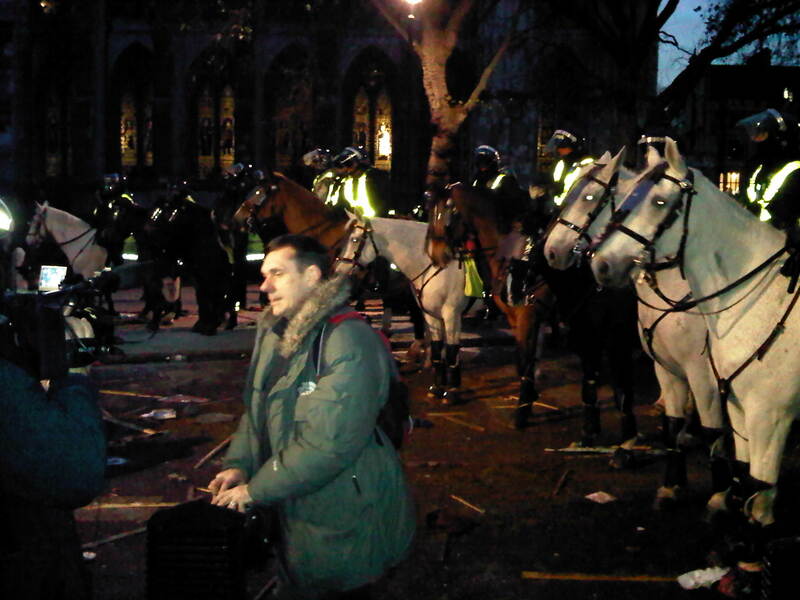 See video footage of police horses charging the crowd – unlikely to be shown on Sky! The impact of the Lib Dem leadership voting for the policy was very evident outside as young people challenged police control lines and chanted “Shame on you for turning blue” whenever Clegg’s name was mentioned. He was, of course, called a lot worse. There was a deep-rooted sense of betrayal amongst young people and probably the majority of the anger was directed at Clegg and his supporters (a reducing number of people as time goes on). For my part I believe that it’s crucial to be a man or woman of your word. If there is an explicit promise made in writing and on film (and it’s a promise that has no conditions attached ) … well you can’t renege on it – at least not without undermining your credibility with the electorate and feeding the cynical attitude that ‘you’re all as bad as each other’. The Observer said this on Sunday, “the (tuition fees) furore risks cementing coalition in peoples minds as licence to break promises”. When the referendum on changing the voting system comes there’s a real danger that people will say, ‘well if that’s the result of the kind of coalition that would come from electoral reform, I don’t want to vote for it’. In any case Clegg did not hold the Party together. His attempt to appear tough with his own MPs backfired badly as more Lib Dem MPs voted against or abstained than voted for the policy put forward by the Lib Dem leadership. 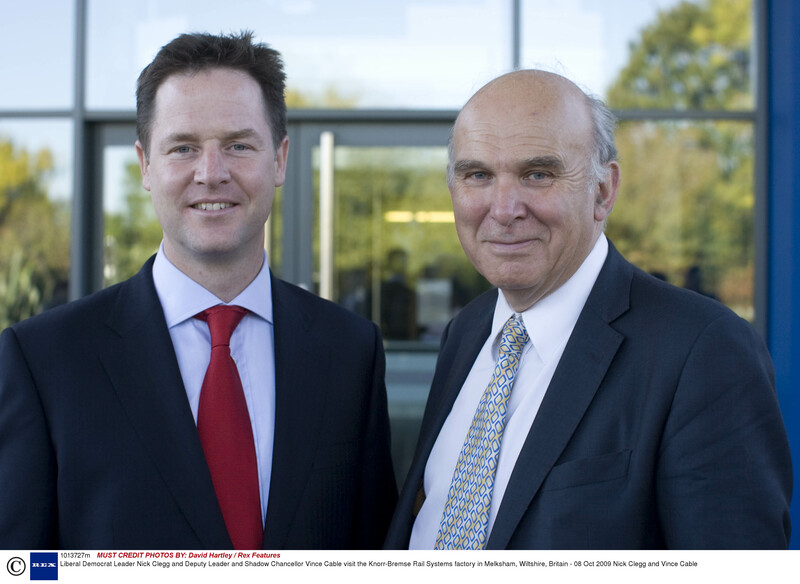 Clegg is weakened by this – as is our Party. So a pretty comprehensive disaster Nick! You have managed to deeply damage public trust in our party, particularly amongst young people and you have caused major division in the Lib Dems at the same time. That is the kind of leadership we can do without. 28 Lib Dem MPs voted in favour of trebling tuition fees proposals, 21 voted against, 8 abstained. Wise investors will buy the Pound because of Hung Parliament likelihood! This election is likely to centre on two issues; economic competence and the expenses scandal. Vince Cable of the Lib Dems is respected as being the most astute and honest of the potential Chancellors, way ahead of George Osborne. A hung Parliament will see Dr Cable taking the economic reins of the country to the relief of millions. We cannot afford the amateur economist Mr Osborne, because nobody has the faintest idea how he would balance the books. Many fear it will be them who will pay in the mass job losses and tax increases so carefully hidden to date. The Conservatives’ slick presentation reminds me of Blair in 1997. It is not yet clear if the electorate will fall for that again. The bigger issue is of course the economy and the huge government debt we face. I for one would rather entrust decisions about this to Vince Cable than to George Osborne. I sincerely hope that the electors of South West Surrey will not take a leap in the dark with Osborne. This election gives us all the opportunity for a real political change. With a hung Parliament we are likely to get Vince and sound economics at last.